Ah. That clinched it. 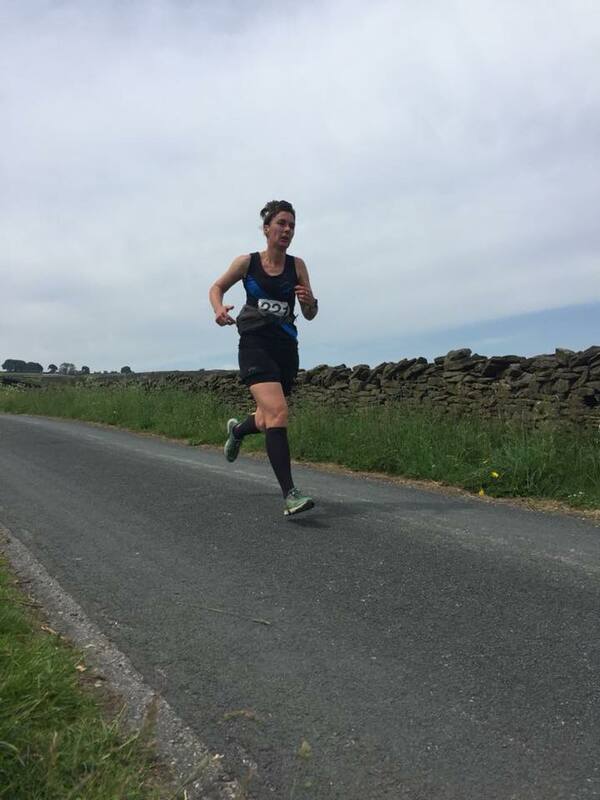 Although I know this is perverse, I’m very fond of Tour of Pendle, maybe because I got a 25 minute minute PB on it last year on my birthday, or because I feel like a steely adventurer, Ernest Shackleton-like, when I remember the year before when I ran much of it through a snow blizzard. Even so, Weets should not have been an option: an hour’s drive to run just over five miles slightly skews the miles-mileage scale that I usually operate under. (This translates as: distance travelled vs distance to run. High Cup Nick is the one race that is immune to this scale.) So, up early on Saturday morning and over to The Other Side where the clubs are called Trawden and Barlick and they talk different. The weather forecast predicted heat, but I was chilly in the car and the sky looked overcast, so I was unprepared. I didn’t apply suncream and I set off wearing a buff. Idiot. The race HQ was a small marquee in Letcliffe Park outside Barnoldswick (which I’ve only lately realised is where Barlick gets its name and that Barlick isn’t a place. To this, my clubmate Jenny said, “Rose, there are some things you don’t admit to.”) The park is hidden off Manchester Road so that even when your sat nav tells you you’re there, you think you aren’t. Only the sight off to the right of juniors running up and down a hill made me realise I was in the right place, and a phone call to already arrived folk got me into the ample car parking on the field in the park, which I’d never otherwise have found. 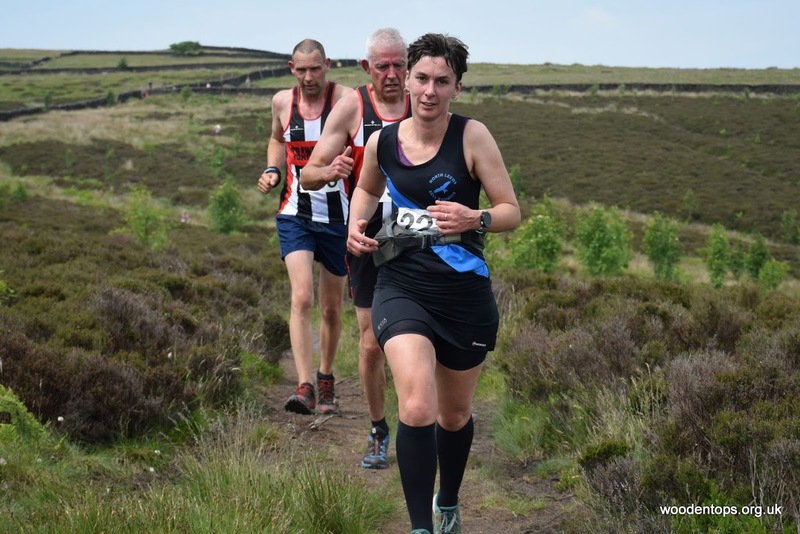 £5 entry, which is just acceptable on the other well-known metric of fell-running, the Wallace-Buckley scale, a joint Yorkshire-Scottish effort named for its inventors, that dictates that no race should cost more than a pound per mile. This has the handy effect of ruling out most road races, so is very useful. There were more people at Weets than I’d expected, but maybe everyone else was fond of Tour of Pendle too. 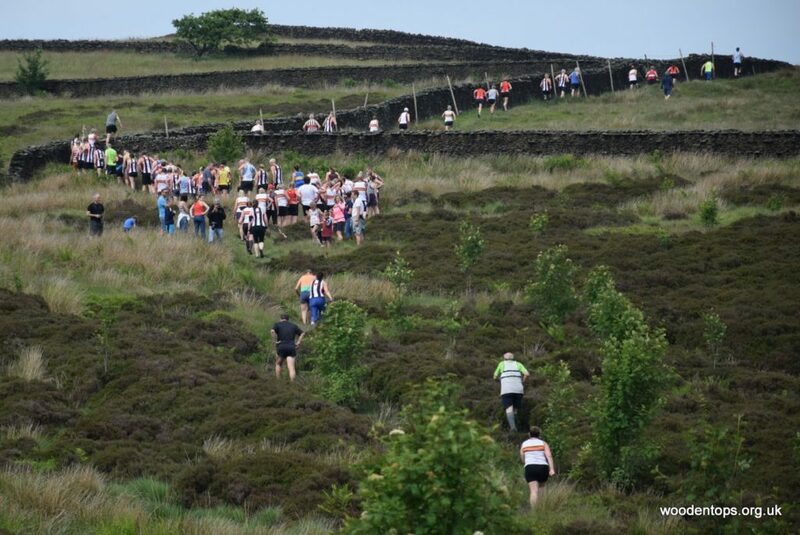 I like small fell races, but I also like race fields that are big enough that my chances of being right at the back are minimised. Up we go to the tarmac lane where the start is, and there is some milling. 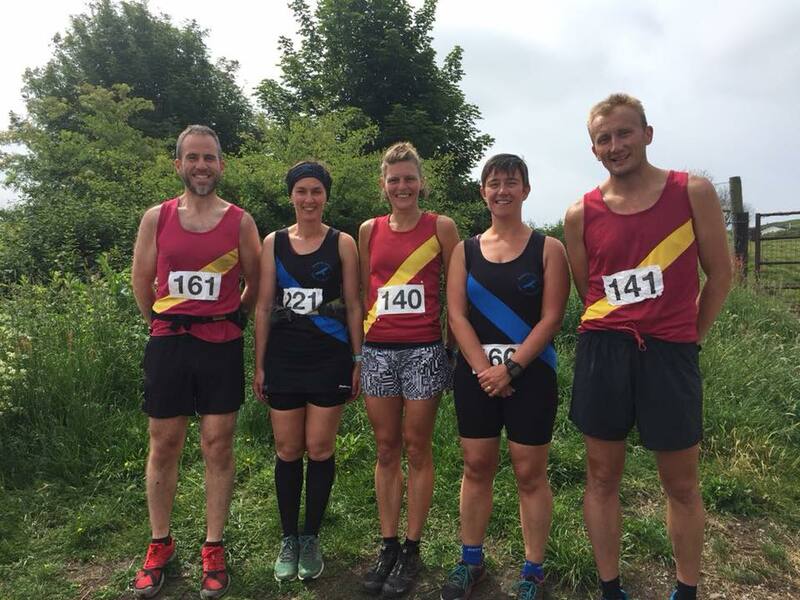 The NLFR team consisted of me and Jenny, so we had a collegiate photo with FRB, Karen and Gary from P&B where our vests managed to almost perfectly reflect the race profile. So I did. Eck though it was hot. The buff came off straight away and I was thankful that I had conformed to my usual policy of always running with water even when hardly anyone else did. Up we go, up the tarmac road, and I felt sluggish and heavy but kept going. Lots of Barlick supporters, so many that I began to think my name was Nicola, as it was constantly shouted in my direction. (She was just behind me.) Up and up to the trig point on Weets Hill, where I was surprised to see runners already coming back down, and they all seemed to be aged about 11. I cheered them on, of course, then later found out that a juniors’ race had set off with us but was just going to the trig and back. So they weren’t actually leading our race. But still, well done. After the trig, a lovely descent, whoosh, which was so good I forgot that we’d be going up again. I’d checked the race profile and knew that there were four climbs and that we’d only done two. Still, whoosh. The next climb was definitely the mini-Pendle one. I’d drunk plenty by that point but still felt a bit drained, and even more so when I looked up and saw a hill with no end. So I did my usual technique of counting. I have an entente cordiale method of getting up hills: if they are really huge (Whernside, Clough Head), I count in French. Backwards. Having a tired brain figure out the right order for deux cents quatre vingts dix neuf gets you up about thirty feet. I can get up Whernside in 300 in French, but Clough Head was about quatre cents. For smaller hills I use English. One to ten, for as many times as it takes. It passes the time, your brain is distracted enough not to think of all the climb you haven’t yet done, and you keep moving. There was another fine descent down a familiar grassy field (the route is an out and back with a loop, so classic lollipop), where I ran past a fellow, while exclaiming, “I like this bit!”. He rightly ignored this, an example of the Fell Running Observations of the Bleeding Obvious. Then up a tarmac lane, back over the fields, a bit of narrow trod moorland running where I could feel blokes breathing closely behind me, but they didn’t ask to pass so I didn’t offer. One of the lads did pass me and the other one didn’t, which is OK with me. 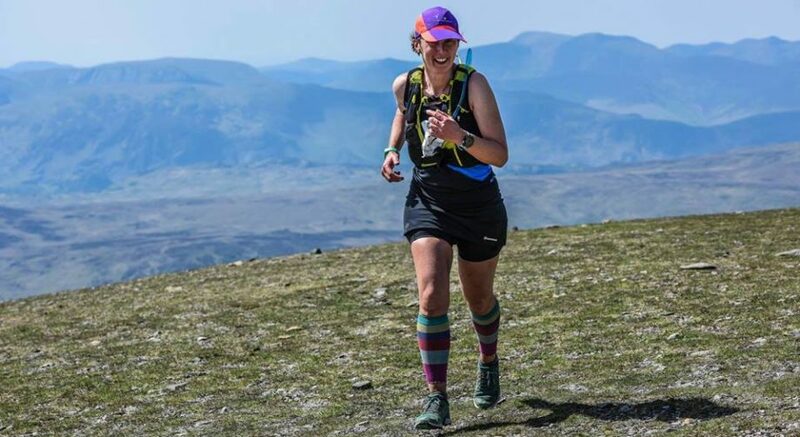 I managed to put the brakes on in time at the finish funnel, so didn’t take out any of the marshals, and then there was the usual splendid fell running tradition of people you finish around saying well done and you saying well done back. I deviated slightly from this by telling the Trawden “lad” (actually a six-foot 40ish fully grown man) not to tell Dave he’d beaten me. Then I downed several cups of squash and we went to a very fine pub and I ate a veggie burger that was bigger than me and all was well. Well done! Where are the stripey socks though? 🙂 I didn’t know there was a proper way to wear a vest with a sash – good thing I never got one. As my hamstrings and I continue to have words, would appreciate more on what Lucy told you and any exercises/tips either physio has given you that help. I do try to “activate” glutes pre-run as well as strengthen glutes, hips, and hams but I am always looking to do and feel better! Ah yes, counting. You’d imagine I’d have a vague interest of course. I use the One-2-3-4, 1-2-3; Two 2-3-4, 1-2-3; etc technique for flat runs (a la Church Fenton on the whole) which is to match breathing. This (4 in, 3 out) has to be refined on slopes or when trying to speed up but you get the basic drift. Amazing how far you can travel before you run out of numbers. I like the foreign languages slant to this.